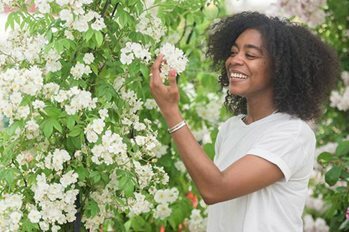 New for 2018, The Long Border competition at RHS Chatsworth Flower Show gave plant enthusiasts from all backgrounds –including students, garden designers and community groups – the opportunity to design, plan and build a horticultural show exhibit. Featuring high summer colour and offering masses of inspiration, the mixed borders in the competition were designed to interpret the theme of movement, with each border measuring 7x1.8m. Here, we've picked out our favourite planting combinations from this year's competitors to recreate at home. Alliums are great for pollinators and don't just come in purple or white. Here in Louisa van den Berg's Gold-medal winning border, Mind the gap: Bees on the Move, blue-flowered garlic, Allium caeruleum, floated among ornamental grasses (Deschampsia cespitosa 'Garnet Schist') and striking yellow achilleas. Louisa's Long Border also included a range of different flower types and sizes to attract different types of bee (we have around 250 native species so they have a range of requirements). Trifolium ochroleucon – a relative of clover – is ideal for smaller bees. Salvia 'Amistad' made a strong statement in Georgia Kralj's Long Border, Splash, with its inky purple flowers and near-black calyces. It blooms for a long time and is loved by pollinating insects. It contrasts beautifully with silver foliage and pale blue flowers such as hardy geraniums and the turquoise blue delphinium 'Magic Fountain'. In Elastic Motion, a Long Border designed by Amber Norman, burnets (Sanguisorba) added height and movement as their bobbly flowerheads wobble in the slightest breeze. Miniature hedges of purple-leaved berberis set off the palette of pale blue-mauve flowered perennials to perfection. In terms of contrast among herbaceous plants, it was pretty hard to beat this combination of peony 'Bowl of Beauty' teamed up with Mexican feather grass, Stipa tenuissima. This combination, featured in Summer Breeze by Kristian Reay, also works in combination with Salvia 'Caradonna' (see below), proving its versatility. Designer Samantha Harvey planted Salvia × sylvestris 'Rose Queen' with astrantias, achilleas and Mexican feather grass Stipa tenuissima in her Long Border, Rhythm of Colour. These interesting textures make for a colourful combination in a sunny spot. Wood melic (Melica uniflora f. albida) is a delightful native woodland plant with delicate airy seedheads, described by Beth Chatto as being 'like tiny grains of rice'. It was shown to perfection against the dark tones of a clipped yew ball in Turning Point by Mary Swan. Also featuring in Mary Swan's design was Knotted cranesbill (Geranium nodosum 'Silverwood'). This makes a wonderful plant for shady gardens. Its fresh, light green leaves light up dark corners and it bears silver-white flowers for a long period in spring and summer.